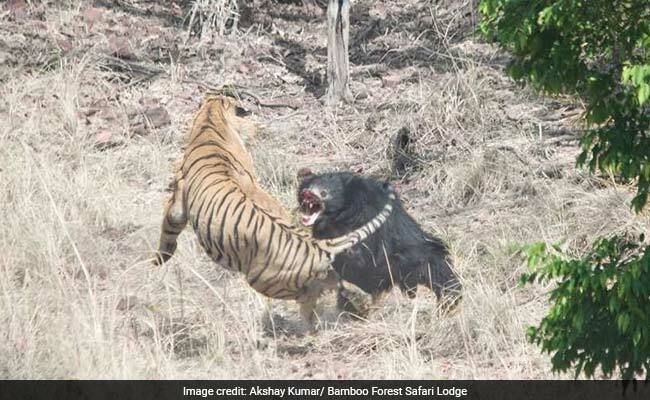 A vicious encounter between an adult tiger and a sloth bear at Maharashtra's Tadoba National Park has been caught on camera. Scroll down to see the startling footage. 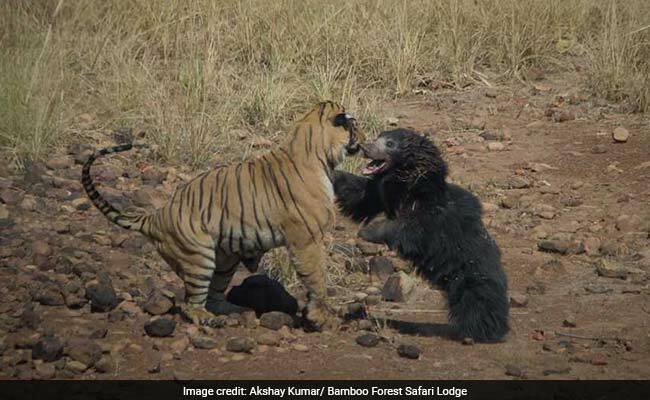 A viral video from Maharashtra's Tadoba National Park captures a violent face-off between an adult tiger and a sloth bear. The video, taken on Wednesday during an afternoon safari, shows the encounter between two fierce members of the animal kingdom. The video begins with the tiger chasing away the bear but suddenly, the sloth bear charges at the tiger. A battle ensues and it is far from a playful fight. As the video progresses, the tiger tries to pin the bear down. The sloth bear tries desperately to escape the tiger's grip. The next few tense minutes see both the tiger and the sloth bear viciously charge at each other trying to assert their dominance. Akshay Kumar, the chief naturalist at Bamboo Forest Safari Lodge, tells NDTV that the tiger is 7-year-old Matkasur, a dominant male from the park who has marked the water body called Jamun Bodi, seen in the video, as his territory. The sloth bear, a female, was headed to the water body with her young cub in search of water when the tiger, which was cooling off in the water, attacked. The mother bear, in order to protect her cub, fought back. The distressed cub roared as its mother took on the big cat. For the defensive sloth bear, not known to be territorial, it was her motherly instinct to fight back. "The tiger attacked the bear more than five minutes. 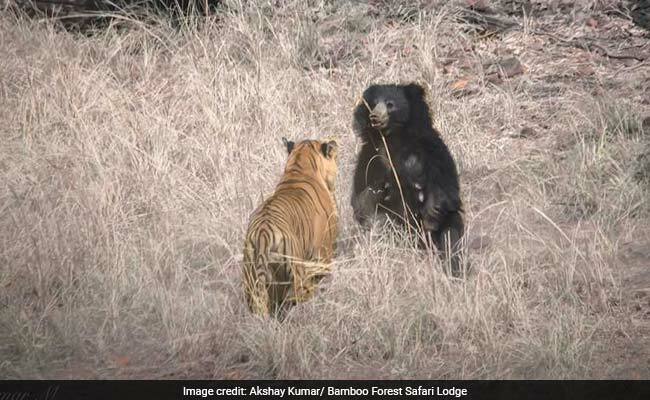 It went after the sloth bear but she kept charging in order to protect her cub," Mr Kumar tells NDTV. "It went on for 15 minutes. The tiger was roaring. It was a severe fight." Both the tiger and sloth bear suffered injuries in the attack. The young cub ran away during the fight. Mr Kumar, who shot the video, was leading a safari with tourists when they spotted the face-off between the bear and tiger. The video went viral on social media. "Sloth bears are easy game," says Dr Anish Andheria, President of Wildlife Conservation Trust. "As you can see in the video, the sloth bear was so exhausted. They can't outrun tigers," he tells NDTV. Although injured, what saved the sloth bear from further attack by the apex predator of the jungle was her fur. "The only thing that saves the bear is the hair on the body, because tiger doesn't get a grip," Dr Andheria explains. Tadoba National Park in Maharashtra's Chandrapur district experiences high temperatures during summer months. Due to the scarcity of water, animals congregate at a common water hole to have a drink. Although such encounters are not uncommon in the wild, it was the first time it was seen in the tourist area of the reserve.